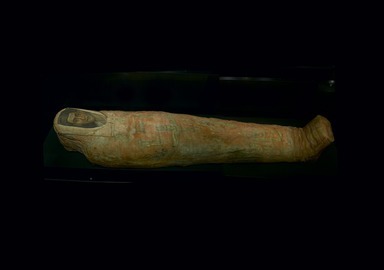 All ancient Egyptians desired to live after death. To Live Forever: Art and the Afterlife in Ancient Egypt illustrates Egyptian funerary beliefs and customs observed over nearly four thousand years by both the rich and the poor. 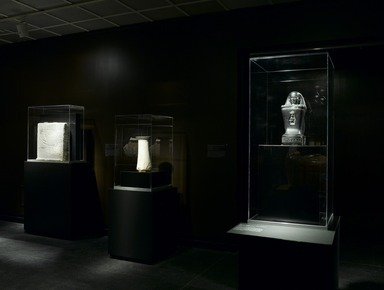 The exhibition answers questions often asked about the afterlife, mummies, funerals, and tombs as it illustrates the variety of strategies used to evade death and, ultimately, to live forever. 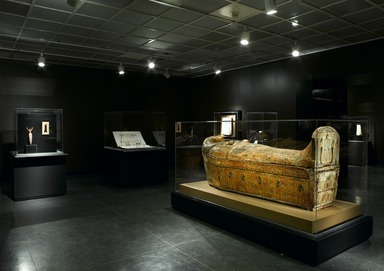 After surveying Egyptian beliefs through papyri and works of art, the exhibition addresses many of the practical considerations an ancient Egyptian faced when preparing for burial. Not everyone had access to the elaborate funeral equipment made for a king. 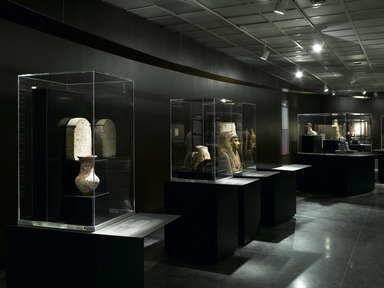 The exhibition therefore illustrates how middle-class artisans and some poorer people made use of cheaper materials and secondhand items in providing for their tombs. In place of vast wealth, they substituted their own creativity to reach the afterlife. 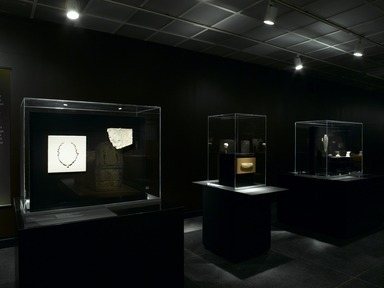 Objects belonging to the middle and poorer classes are shown here near the luxurious goods used by the rich to guarantee their eternal lives, often in side-by-side comparisons. Ancient Egyptian understanding of the afterlife is reflected in the story of the god Osiris. 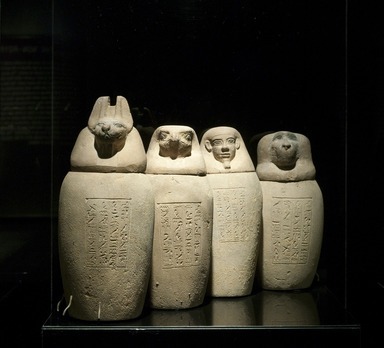 The story also explains why certain objects were desired in an Egyptian tomb. Osiris and his wife Isis were Egypt’s beloved first rulers. Osiris’s jealous brother, Seth, invited the king to a party only to trap him in a special human-form box—like a coffin—exactly in Osiris’s dimensions. Seth and his co-conspirators threw the box into the Nile, and Osiris drowned. Seth claimed the throne. Isis retrieved Osiris’s body and magically revived him long enough so that they could conceive a child. She also built temples for him where he could receive food offerings after death, establishing the precursor of the tomb. Osiris became king of the afterlife while Isis raised their son Horus. Horus later defeated his uncle Seth and became king of Egypt. But all Egyptians wanted to imitate his father, Osiris, at their death by being reborn into the afterlife. Many of the objects in an Egyptian tomb helped the deceased achieve this goal. Egyptians believed that the sun god Re traveled in a boat across the sky from east to west in the world of the living. Reaching the west, he entered the afterlife and then traveled across the sky of the underworld going eastward. Each hour that the god traveled in the underworld he was attacked by Apophis, a dragon-like demon. Only during the fifth hour of his journey was Re safe in the realm of Osiris. At the end of the twelfth hour of his underworld journey, Re was reborn into the eastern horizon of our world. Many of the decorations in royal tombs and on papyrus reveal that Egyptians also desired to travel with Re in his boat after death. The stories about Re and about Osiris, plus a series of magic spells that protected the deceased from danger, provided the knowledge an ancient Egyptian needed to enter, and thrive in, the afterlife. The non-royal elite included people who were literate and worked as high officials in the government bureaucracy or in the temples as priests. This group could afford tombs and all their contents rather than simpler burials in graves dug into the desert sand—the fate of poorer Egyptians. The elite either built stone tombs as small, freestanding buildings or excavated tombs in the side of a mountain. But even within this group, there were degrees of wealth. When they commissioned statues for their tombs, they often had to make choices between more or less expensive materials in order to make the most of their resources. Limestone is soft and easier to carve than black granite or granodiorite. Limestone is also relatively plentiful in Egypt while black granite and granodiorite are more rare and thus more expensive. 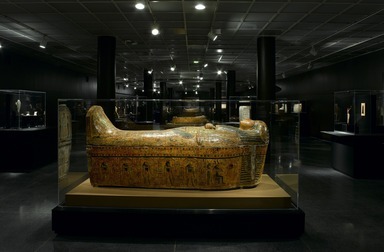 The statues in this section demonstrate some of the choices wealthier Egyptians made in statuary. Furnishing a tomb was the biggest expense in an ancient Egyptian’s life. The coffin alone could cost more than one year’s salary for an artisan. At least four strategies were available to those planning to furnish a tomb on a budget: they could substitute, imitate, combine, or reuse. Often evidence of more than one of these strategies is visible in the same object. Substitution involved choosing a cheaper material where the elite owner would use a precious one. One might use faience, made mostly from sand, in place of gold or a hard, rare stone. Imitation meant decorating one material as if it were something more expensive. For instance, a terracotta mummy mask could be painted yellow to imitate costly gold. Combining involved bringing together in one object two or more elements that would have been separate in an elite tomb. This was especially common in the case of coffin sets. Finally, reuse included removing the name of a previous owner and reinscribing an object for a new user. A government program of recycling tomb objects is known from the end of the New Kingdom, around 1070 b.c.e. These methods of economizing reveal tremendous creativity among those who did not have the means to furnish a tomb according to elite standards. September 30, 2009 Through more than one hundred objects drawn from the Brooklyn Museum’s world-renowned holdings of ancient Egyptian art, including some of the greatest masterworks of the Egyptian artistic heritage, To Live Forever explores the Egyptians’ beliefs about life and death and the afterlife, the process of mummification, the conduct of a funeral, and the different types of tombs—answering questions at the core of the public’s fascination with ancient Egypt. The exhibition will be on view February 12 through May 2, 2010. One of the primary cultural tenets through thousands of years of ancient Egyptian civilization was a belief in the afterlife and the view that death was an enemy that could be vanquished. 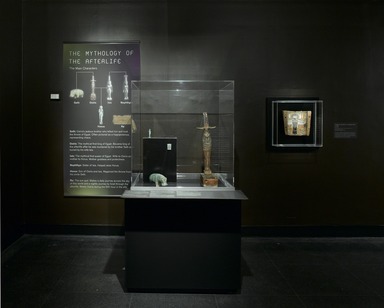 To Live Forever features objects that illustrate a range of strategies the ancient Egyptians developed to defeat death. It examines mummification and the rituals performed in the tomb to assist the deceased in defying death, and reveals what the Egyptians believed they would find in the next world. 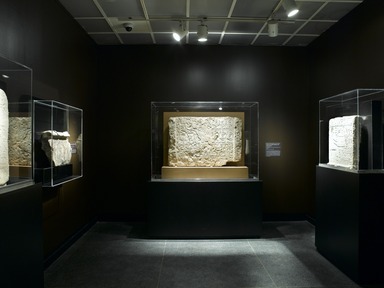 In addition, the exhibition contrasts how the rich and the poor prepared for the hereafter. The economics of the funeral are examined, including how the poor tried to imitate the costly appearance of the grave goods of the rich in order to ensure a better place in the afterlife. Each section of the exhibition contains funeral equipment for the rich, the middle class, and the poor. 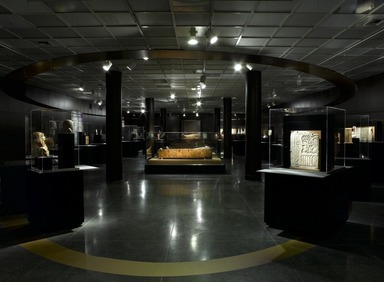 The visitor will be able to compare finely painted wood and stone coffins made for the rich with the clay coffins the poor made for themselves, masterfully worked granite vessels with clay vessels painted to imitate granite, and gold jewelry created for the nobles with faience amulets fashioned from a man-made turquoise substitute. 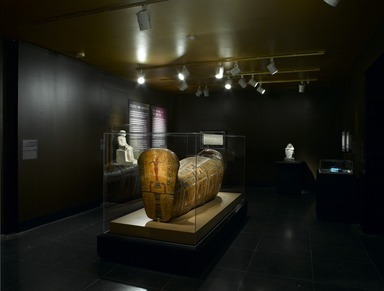 Objects on view include the Bird Lady—one of the oldest preserved statues from all Egyptian history and a signature Brooklyn Museum object; a painted limestone relief of Queen Neferu; a gilded, glass, and faience mummy cartonnage of a woman; the elaborately painted shroud of Neferhotep; a gilded mummy mask of a man; and a gold amulet representing the human soul. 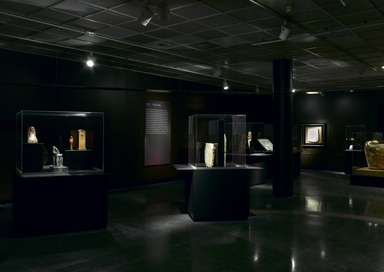 Edward Bleiberg, Curator of Egyptian Art at the Brooklyn Museum, has organized the exhibition. He has authored the accompanying catalogue, which also includes an essay by the scholar Kathlyn M. Cooney; the catalogue is published by the Brooklyn Museum in association with D. Giles Ltd., London. The recipient of an M.A. 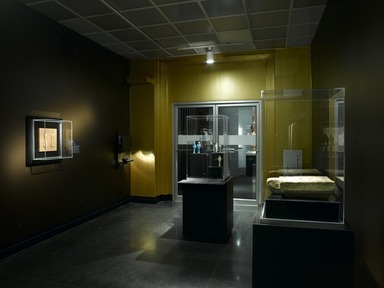 and Ph.D. in Egyptology from the University of Toronto, Dr. Bleiberg is the author of several books and scholarly articles, among them the exhibition catalogues Jewish Life in Ancient Egypt and Tree of Paradise, both for shows at the Brooklyn Museum. 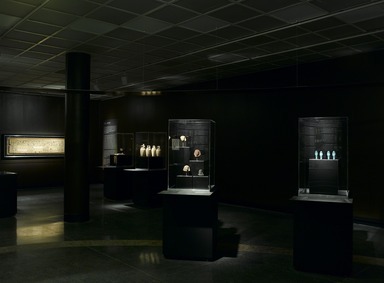 The Brooklyn Museum galleries of ancient Egyptian art contain more than 1,200 objects ranging from Predynastic times through the reign of Cleopatra. The collection, noted for its scope, artistic quality, and historical significance, was begun in the early twentieth century through Museum excavations and the support of collectors who donated works and entire collections. The collection of Charles Edwin Wilbour, formed in the nineteenth century and donated to the Museum between 1916 and 1947, and an endowment given by the Wilbour family in 1931, further strengthened the Museum’s holdings. To Live Forever is organized by the Brooklyn Museum. Having traveled to four museums as part of a nationwide tour that began in the summer of 2008, the exhibition now comes back for a showing at its home institution. 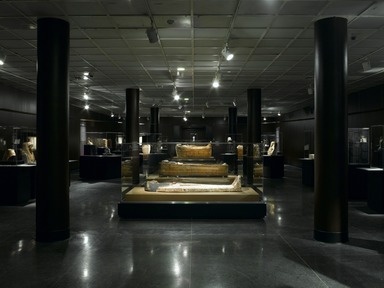 The tour will then resume, continuing through the fall of 2011 and taking the exhibition to an additional five venues. 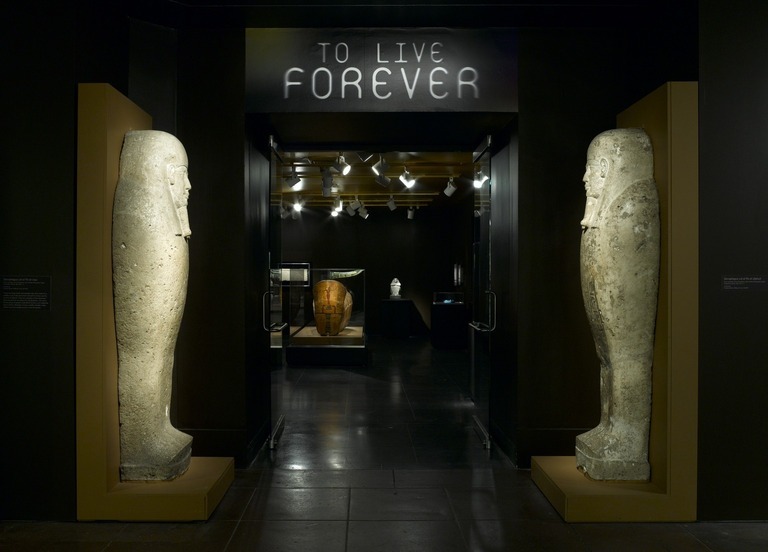 To Live Forever: Art and the Afterlife in Ancient Egypt is organized by Edward Bleiberg, Curator of Egyptian Art, Brooklyn Museum. The exhibition is supported by the Brooklyn Museum’s Charles Edwin Wilbour Fund. Additional support is provided by Fred and Diana Elghanayan and other generous donors. The accompanying catalogue is supported by a Brooklyn Museum publications endowment established by the Iris and B. Gerald Cantor Foundation and the Andrew W. Mellon Foundation.